Stephen Amell and Emily Bett Rickards at the Arrow panel at Walker Stalker Con, March 16th, 2014.. . Wallpaper and background images in the Stephen Amell & Emily Bett Rickards club tagged: smile19 stemily stephen amell emily bett rickards walker stalker con 2014. 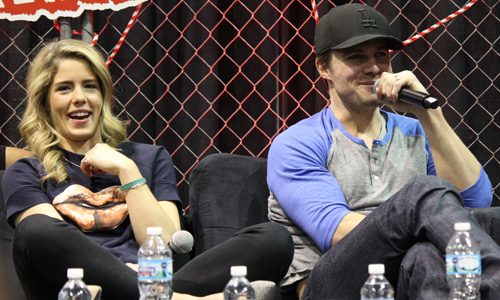 This Stephen Amell & Emily Bett Rickards photo contains grillage and clôture grillagée.